In our last blog post, we shared an article by our friend and college Matthew Rappaport, Esq LLM on Why Opportunity Zone Investments Will Not Replace Section 1031 Exchanges. This week we would like to continue the conversation on Opportunity Zones and share another great article written by our friend, Michael Hurwitz, CPA, MST. Michael is a Partner and REIT Group Leader in the Real Estate Group at Marks Paneth LLP and is a thought leader in the industry. His article goes into more detail on the background, benefits and rules of the Qualified Opportunity Zone program. By now, most real estate professionals have heard about the Qualified Opportunity Zone (“QOZ”) program created by the Tax Cuts and Jobs Act of 2017. On October 19, 2018, the Internal Revenue Service (“IRS”) and the Treasury Department issued Proposed Treasury Regulations that addressed many of the issues related to investing in QOZs, although there are still numerous uncertain areas. Further guidance is needed regarding the implementation and application of these provisions before investors can proceed with their investments and offerings with certainty. Basically, the QOZ program is designed to encourage and incentivize capital investment into some of our nation’s most distressed and underserved neighborhoods by affording investors of all types with substantial tax savings. Currently, the designation of all QOZs now in existence will end on December 31, 2028. 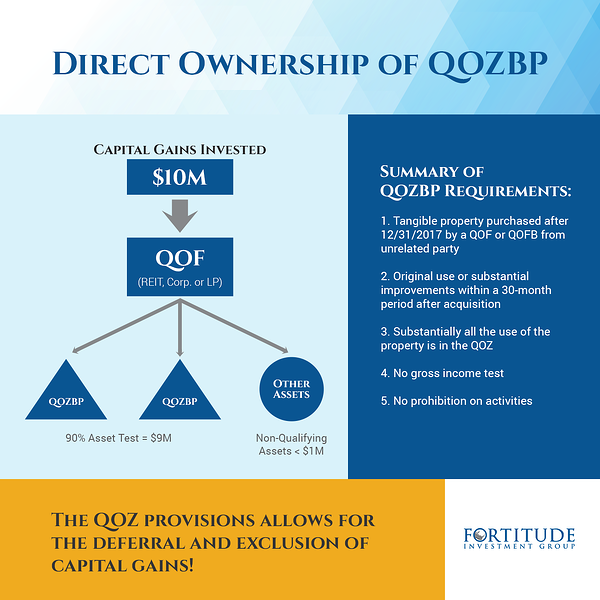 In general, the QOZ program allows any eligible taxpayer, which is defined as any taxpayer (including individuals, corporations, partnerships, real estate investment trusts (“REITs”) and certain other pass-through entities such as trusts and estates), that recognizes taxable capital gains from the sale or exchange of a capital asset to an unrelated party to reinvest the gain into a Qualified Opportunity Fund (“QOF”). The QOF then invests in the Qualified Opportunity Zone Property (“QOZP”), thereby deferring and excluding a portion of taxation on that gain. To qualify, the QOF must be invested in a property within the opportunity zone, which are low-income communities (pursuant to Code Section 45D(d)&(e)) population census tracts specially designated by each state. Investors have 180 days to reinvest the capital gain of the sale or exchange giving rise to the gain of non-opportunity-zone assets (including stock, partnership interests, real estate and even property used for personal purposes) that would otherwise be recognized no later than December 31, 2026, in order to take advantage of the provision’s significant tax benefits. Federal Form 8949 (Sales and Other Dispositions of Capital Assets) will be used by the taxpayer to make an election to defer such capital gain: the 1400Z election. This form will be attached to the taxpayer’s federal income tax return for the taxable year in which the gain would have been recognized if it had not been deferred. There are special rules on how to calculate the 180-day period for partnership electing to defer gains and how partners may elect to defer the gain in situations where the partnership does not elect to defer. Basically, the partner may use either the day the partnership recognized the gain or the last day of such year in which the gain was recognized. There are also similar rules that apply to trusts, estates and S-Corporations. 3. A permanent gain exclusion on the appreciation of the interest in the QOF. If a taxpayer holds an interest in a QOF for 10 years or more, no tax will be due on the appreciation of such QOF interest. This is accomplished by the investor electing to use as the basis of its QOF interest the fair market value on the date the QOF interest is sold; generally, this will eliminate the recognition of gain. Currently, taxpayers have until December 31, 2047 to make this fair market value election. The above described tax benefits are designed to reward long-term investments in distressed, low-income communities. The new tax regime requires the QOF to be classified for federal income tax purposes as either a partnership or corporation for the primary purpose of investing in a qualified opportunity zone property (QOZP), which cannot include other QOFs. The QOF must hold at least 90% of its assets in QOZP; this is referred to as the 90% Asset Test. QOZP is defined as any of the following investments: i) qualified opportunity zone business property (“QOZBP”), ii) qualified opportunity zone stock (“QOZ Stock”) and iii) qualified opportunity zone partnership interest (“QOZ Partnership Interest”). During substantially all the QOF’s holding period the use of the property is within a QOZ. A prohibited activity of “sin business” may not be conducted (i.e. operating a golf course, gambling facility, massage parlor, racetrack or liquor store, to name a few). 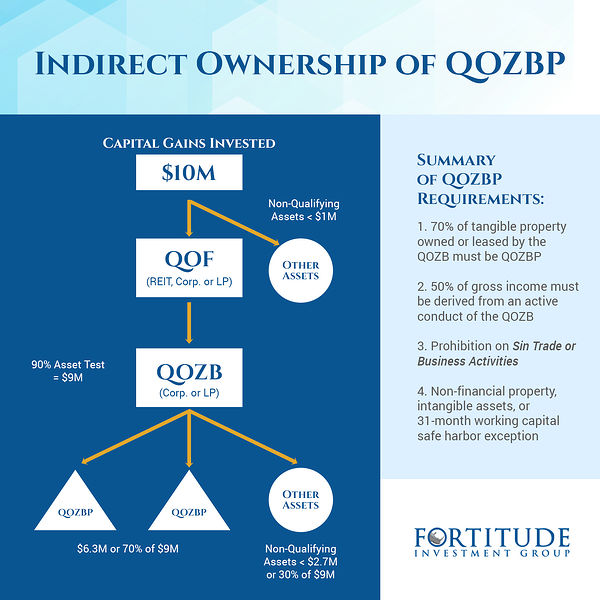 Clearly, there are several critical distinctions between QOZBP owned directly by the QOF and QOZBP owned indirectly by a QOZB; as a general matter, holding investments through a QOZB (the double-tier structure) creates greater flexibility in structuring QOZ investments, especially for developers that acquired undeveloped or dilapidated property prior to December 31, 2017. The primary differences pertain to the asset tests (90% test for all assets vs 70% test for substantially all assets) and the working capital safe harbor. These two factors coupled with the related party sales could allow for existing owners to achieve the QOZ benefits. If a developer sells property to an unrelated party, the developer may retain a minority interest (the provision currently allows for an interest of less than 20% to be retained) in the new owner’s investment. Subject to additional guidance from the Treasury, there may be other structuring transactions whereby a developer can retain its full investment and achieve some of the tax benefits offered by the QOZ regime as well. These strategies include implementing a land lease structure, acquiring other tangible qualifying property in the QOF or QOZB to increase the total tested assets (allowing more non-qualifying assets) and/or contributing such property to a fund. In addition to these structures, taxpayers can further enhance their returns by using a profits interest in the QOZB and charging customary arms-length acquisition, leasing and disposition fees. Keep in mind, many of these latter arrangements raise difficult business and non-tax legal issues for the parties involved, including the construction and primary secured lenders. Given its unique potential for significant tax savings, it’s no wonder that everyone’s talking about the QOZ program these days. However, like any other investment vehicle, the program should not be entered into hastily. The government has requested comments to several key issues with respect to these Proposed Treasury Regulations and anticipates issuing additional guidance in early 2019. Until such time, taxpayers, developers, investors and sponsors should seek professional advice from their professional tax advisors in understanding and analyzing these provisions based on their specific facts and circumstances. The material and views are those solely of the author, Michael Hurwitz, and does not necessarily represent the views of the presenting party, nor their affiliates. To read more of Michael’s original blog article, click here. If you have any questions about this subject or know of anyone considering a 1031 Tax-Deferred Exchange and needs a little guidance, please feel free to reach out to our team. We look forward to being of service to you! Are you considering a 1031 Exchange? Download this FREE ebook to help properly facilitate your next 1031 Exchange!